The wearable will connect to the Health Mate app, which can give users insights about their heart rate and sleep patterns. This morning Withings announced the latest addition to its product line: the Pulse HR, a connected wearable that can track a user's heart rate using photoplethysmography (PPG) sensors that can measure pulse in 10-minute intervals while offering continuous heart rate measurements for each workout session. This comes only months after Withings was bought back from Nokia by its original cofounder Eric Carreel. The wearable, which connects to the Health Mate app, offers dedicated multi-sport tracking for 30 different activities — including volleyball, rowing and skiing. According to the company, users have the ability to see their heart zone and calorie rate after each workout. Pulse HR also has a GPS system geared to help users with outdoor workouts. The technology also looks at rest in addition to workouts. It can track sleep patterns and quality. On a practical note, the technology can wake users up with a vibration alarm. Similar to other Withings products, it promises a 20-day battery life. This continues Withings' dive into the digital health space since it was reacquired by Carreel in May. It is now continuing to carve out its space in the wellness area, which is seeing more and more tech giants looking to health. For example, in September Apple Watch Series 4 announced that it landed FDA clearances for its technology, which has an atrial fibrillation-detecting algorithm and an ECG. But in an interview with MobiHealthNews in September, Carreel said he doesn’t see those entrances as an obstacle for the company, rather as an opportunity. The Withings brand has been through a number of changes in the last few years. The French company was originally founded in 2008 and became popular for its smartphone-connected weight scales, blood pressure cuffs, activity trackers and thermometers. In 2016, the company was sold to Nokia for $191 million. But the brand struggled under Nokia. In February, it announced that it would be conducting a strategic review of its digital health division, as well as an update to the company-wide cost savings plans, which included reductions. Shortly after a strategic review was announced, a leaked memo shed light on the state of the division. The Finnish tech company finally announced that the health division was up for sale. In May, Carreel, who was the original cofounder of the health tech company, swooped in and bought back the brand. 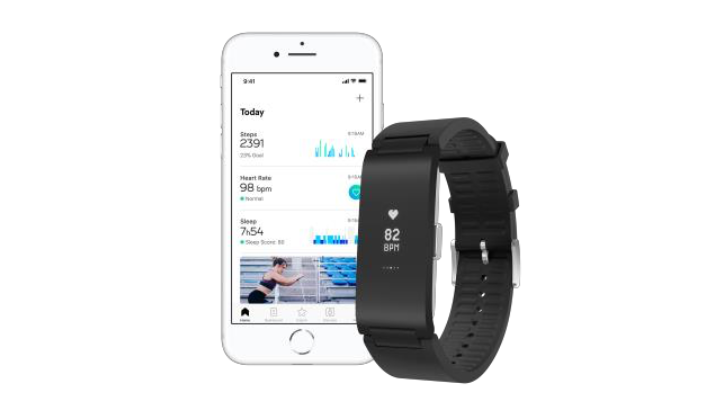 Since buying back the company, Withings has launched the Withings Steel HR Sport, which also offers heart monitoring and a connected GPS, as well as a “fitness level assessment” based on Vo2 max. “At Withings, we are dedicated to providing people with premium health and fitness tracking options that they can select from that best suit their personal lifestyles. With Pulse HR, we wanted to give people a new form factor from our Steel and Steel HR range that still offers the same wearability, quality design and best in class battery life," Eric Carreel said in a statement. “The band is the perfect fit for anyone who wants a device that offers important tracking features like heart rate monitoring at an affordable rate."